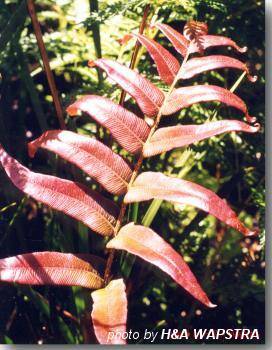 Medium sized coarse fern , fronds dark green, erect, bearing dark scales. Widespread and abundant from sea level to 1000m in a range of vegetation types but broadly absent from the Midlands. May be dominant groundcover in rainforest and wet sclerophyll. Grows in extensive colonies.Will not tolerate dryness but will tolerate salt-laden winds in coastal situations. Fronds containing ripe spores can be placed in a paper bag which is left upright in a dry and draught-free place. Spores should begin to release immediately and all spores are released within days unless the species has tough, leathery fronds. Spores settle at the bottom of the bag. Some species produce vast quantities of spores from one frond, others require dozens of fronds to produce the same amount. 2-4 weeks after sowing specks of green appear. These are the young prothalli and during the next 6-12 months they are at risk from overcrowding and pathogens. When the first fronds appear the sporelings can be slowly hardened by gradual removal of the container cover. Great care must be taken to avoid drying out. Prick out sporelings when the second frond appears. Suitable below powerlines. Propagate by division of rhizome. This method has a high success rate. This species is suitable for tub culture.